Get in touch with nature at Nuuksio National Park and Beach Mansikkalahti. Change things up with these side-trips from Helsinki: Teijo national park (in Pernio) and Linden Esplanade (in Kotka). 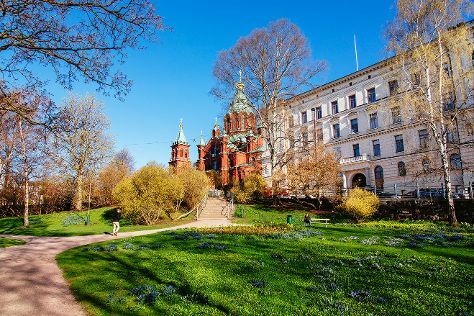 And it doesn't end there: browse the exhibits of Sea Fortress Suomenlinna, take in the architecture and atmosphere at Helsinki Cathedral, stop by Liopro Finland - Handmade Souvenir, and wander the streets of Katajanokka. For where to stay, maps, traveler tips, and other tourist information, you can read our Helsinki vacation builder . If you are flying in from United Arab Emirates, the closest major airport is Helsinki Vantaa Airport. In April, plan for daily highs up to 9°C, and evening lows to 0°C. Wrap up your sightseeing on the 22nd (Mon) early enough to travel back home.